Sequel is shipped with, and installs several utilities into the library called ASCSUPPORT. 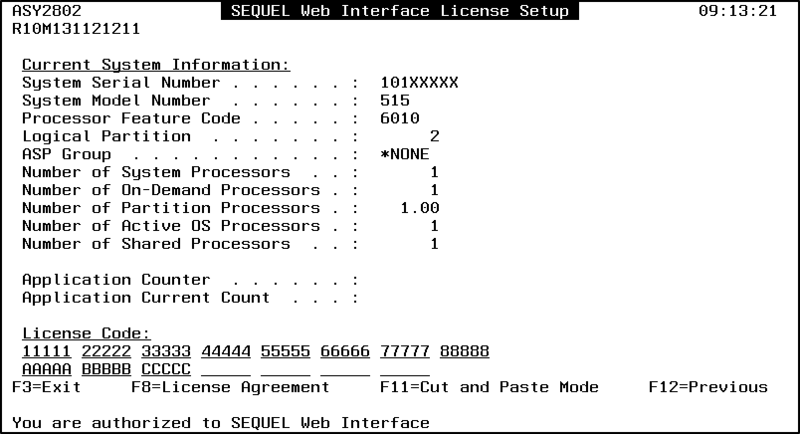 Most of these utilities are used by internal processes, but sometimes they are used by Sequel Software support technicians during the process of a problem resolution. Many of these utilities can be useful to you, the Sequel user. Below we have listed the most useful utilities along with the definitions for each of their parameters. All these utilities can be accessed by prompting (F4) their associated command at a command line. A new logging utility has been added to the install process. This utility provides installation information regarding what product(s) and version was installed and what product(s) and version existed prior to upgrade. Information will be logged when installing Sequel, Showcase, Esend, Abstract, Sequel Web Interface, and AnyDate. A unique record key to the file generated at the start of an install process for a product, library, or environment, and used again at the end of the install for that same product, library, or environment. Pos. 1 = E for environment of L for Library installs. Pos. 2 – 8 = Number from 0000001 to 9999999. STRDTM Z ‘Start Date and Time’ The date and time the install started for a given product library or environment. ENDDTM Z ‘End Date and Time’ The date and time the install ended for a given product, library, or environment. INSSTS 1 ‘Sts’ (status) Set to * when the install starts for a given product, library, or environment, and set to blank when the install finishes for a given product, library, or environment. INSLIB 10 ‘Library’ Product’s install library. N = New - This is a new install of the environment or library. U = Upgrade - This is an upgrade of an existing environment or library. For an upgrade release and mod (RelMod) information from previously installed environment or library. For a new install this is blank. RelMod info of the currently installing environment or library. SYSNAM 10 ‘System’ Name of the system the product was installed onto. SERIAL 8 ‘Serial#’ Serial number of the system the product was installed onto. USERID 10 ‘UserId’ User ID that performed the installation. ENVNAM 4 ‘Env.’ Reserved for future development. ENVDSC 30 ‘Environment Desc’ Reserved for future development. ENVACD 3 ‘Act’ Reserved for future development. ENVACT 60 ‘Action Description’ Reserved for future development. 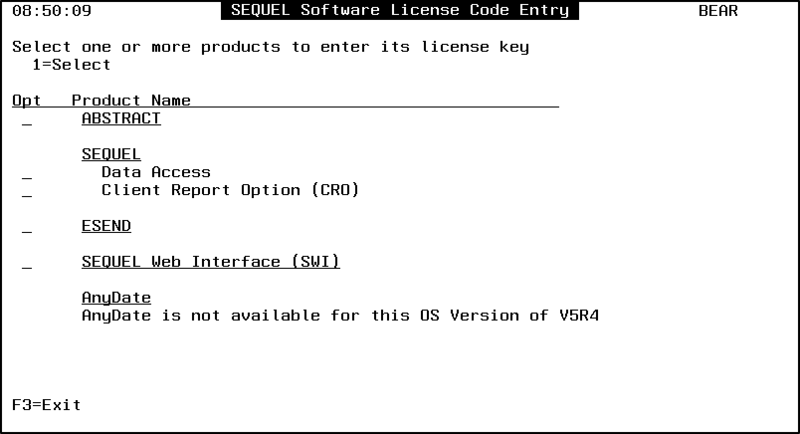 The Sequel Software License Code utility (BICODES) is used to manage the license codes for all your Sequel Software Products. The Change Company Name (CHGCMPNAM) command is used to change the company name for a licensed Sequel Software product. PRODUCT - Specify for which product the company name will be changed. COMPANY - Enter your company name. You are limited to 40 characters. REPLACE - Specify whether an existing value will be replaced with a new one. The Restore Object from IFS Stream File (RSTOBJIFS) command restores to the system a single object or group of objects from a stream file (similar to a zip or save file). OBJ Specifies the name of one or more objects to restore. *ALL All the objects saved from the specified library are restored. generic-name Specify one or more generic names of groups of objects in the specified library to restore. name Specify the name or names of specific objects to restore. LIB Specify the name of the library that contained the saved objects. OBJTYPE Specify the type of object to restore. Use *ALL to restore all types. TOLIB Specify the library to restore the objects into. FRMSTMF Specify the path and IFS stream file name in the format: /path/filename. DEV Specify the name of the device that contains the IFS Stream file. The Save to IFS Stream File (SAVOBJIFS) command saves to an IFS Stream file (similar to a zip or save file) a single object or group of objects located in the same library. OBJ - Specifies the name of one or more objects to save. *ALL All the objects from the specified library are saved. generic-name Specify one or more generic names of groups of objects in the specified library to save. name Specify the name or names of specific objects to save. LIB Specify the name of the library that contains the objects to save. OBJTYPE Specify the type of object to save. Use *ALL to save all types. TGTRLS Specify the release of the operating system where you will restore the object(s). *CURRENT The target system operating system is at the same level (or higher) as the source system. Use the format VxRxMx, where Vx is version, Rx is the release, and Mx is the modification level. *PR The target system operating system is at a lower level (up to two versions lower) as the source system. TOSTMF Specify the path and IFS stream file name in the format - /path/filename - that will receive the saved objects. REPLACE Choose whether to replace an existing object with a new one. The Work with Selected Jobs (WAQZ) command displays information about active ViewPoint users. Name Specify the name of the job to be displayed. QZRCSRVS is the default name of all Client Access jobs. User Specify the user profile under which the job is run. QUSER is the user that runs all ViewPoint jobs. Number Specify the job number assigned by the system. *ALL will list all jobs for the specified job name and user. STATUS Specify the job status. *ACTIVE displays all active ViewPoint jobs. USER Specify the Current User of the job. Product Name This is the generic name of the Sequel Software product. In most cases, this matches the default library name. Library Name This is the current library name for the listed product. With the exception of ANYDATE, which always uses OVRSYSDATE as the library name, the product library name is determined from the product name command in QUSRSYS. For example, the command QUSRSYS/SEQUEL has a product library of Sequel, therefore that is the library name displayed. DBCS Capable This value shows the current DBCS capable status by analyzing the IGCDTA setting of the Printer file RSL809P in each product library. Y Will make the Printer and Display files DBCS capable. N Will remove the DBCS capability of the Printer and Display files. When ENTER is pressed, all the Printer and Display files in the library will adopt the same DBCS status. The Sequel compressed file (SQZIP) command creates zipped files on the IFS containing single or multiple IFS files and documents. There is an option to password protect the zip file. Note: This command is used internally by other Sequel utilities, is not intended for end-user usage, and is listed only for completeness.